WARNING: Strong Tax Geek Content here. I’ve been a longtime TurboTax user and this year I opted for the Home & Business Version thanks to FiscalGeek actually making some money last year. My normal return is usually not too hairy since I haven’t had any real investments outside my 401k so I was always opted for the Deluxe version. This year I had all sorts of stuff I wasn’t quite sure how to deal with so I upped the ante hoping that TurboTax would answer all of my questions for me. I have to say it went sooooo easy and I learned quite a bit about small business taxes along the way so I can be smarter for 2010. I’m not going to walk you through the full rundown of the program since you can do that for free yourself but rather I’ll show off some of the highlights as I went through my tax preparation. That’s a good tip you can run through your whole tax scenario without paying so much as a dime until you want to file and print out. You haven’t got much to lose. Last year over 20 million people used TurboTax to file their taxes so you’ll be in good company. You start off with TurboTax asking you a variety of information about any major events that it should consider as you work through your taxes. It’s a very friendly way to get you thinking about job changes, home purchases, having kids, investing and the like. A simple checkbox and you are on your way. It will continue to prompt you through all the important events broken down into Personal and Business spanning: Income, Deductions & Credits and Other Tax Situations. What I liked was how much information I got as a new small business owner regarding purchases, depreciation, amortization and recommendations on startup costs. 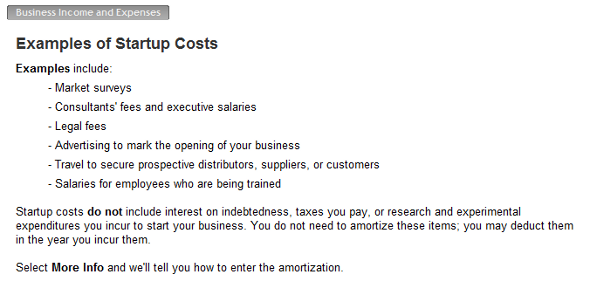 Here you’ll see a flyout window giving you some more info on what constitutes startup costs and how to account for them. As you move through the various screens there is frequently links to “Explain This” which give you some concise information on that particular topic. You can also get more specific help from the Live the Community that changes context depending on the current page you are working on. So when you’re working away on your business information you’ll see topics such as: didn’t receive a 1099 misc or How do I close a sole proprietor business? All very useful information and right there with you. It really takes the fear of doing your own taxes down to a minimum. 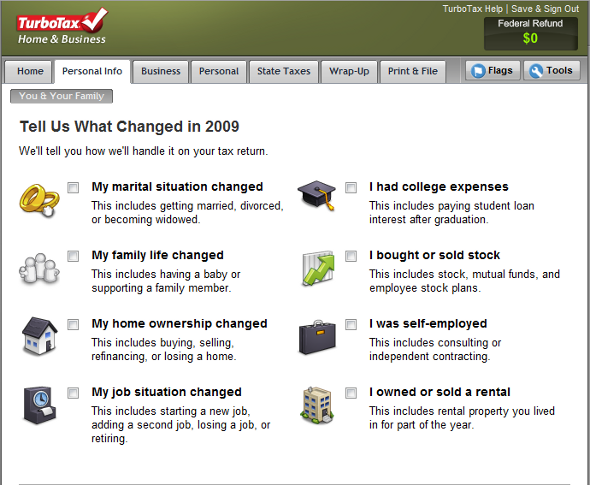 All of the various forms of credits and deductions from the various stimulus packages are included with the 2009 edition of TurboTax. From TurboTax I learned that about 95% of the taxpaying community is eligible for some part of $13,000 per person. It’s not likely you’ll qualify for all $13,000 unless you bought a house for the first time, improved it with a corn husk stove and so forth. But at least TurboTax will make sure you cover all of the options. 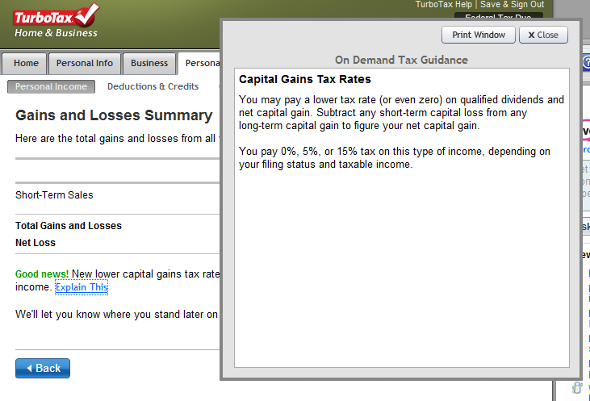 So based on all manner of feedback from the previous versions of TurboTax Intuit has made some additions to this version. On every screen as you move through TurboTax is the capability to put a flag on that page effectively bookmarking that screen so that you can return at any time. This feature is particularly helpful if you’ve started to enter in say Income for something but realize you don’t have all of the data right there in front of you. So you can very easily go back there later to update the data by clicking through on your flag. TurboTax has always done a full Error Check of your data at the completion of your return but now they’ve added error checks whenever you enter data hopefully catching any mistakes before you move on to another section and forget what you might have been working on. It’s much easier to deal with the problem when you it’s fresh rather than have to flip back at the end. Honestly there isn’t much to quibble with but I HATE that little running tally in the upper right corner that shows you the amount of your tax refund or how much you owe. I’d rather have it give me the damage at the end otherwise you are sweating stuff back and forth. At one point it showed me owing over $5000 and I had beads of sweat forming on my brow thinking I had miscalculated my tax withholding but I forgot I had not added my mortgage interest and all of my charitable donations so all was right with the world at completion. I could have done without the blood pressure spike though. So perhaps an option to turn off the ticker if you desire? I love first and foremost that I can keep rolling my data over year to year helping me avoid duplicate entry plus it’s smart enough to ask me about events that occured last year that might still be applicable. It took me no more than about 90 minutes to work through everything because I had all my data gathered. And I read everything in detail, if you’ve got a simple return it may be even quicker. Filing is super easy online and you’ll get your refund quickly if you’ve got one coming. It’s one piece of software that I wholeheartedly recommend without so much as a caveat. Get cracking April 15th isn’t that far off. 1. I couldn’t figure out how to carry over the $500 refund to next year. Not that big a deal as “free” eFile was included with the package and the money will end up in my checking account where I can move it to my money market for next year. 2. It didn’t cover how to deal with a Simple IRA. I finally remembered how I learned to deal with it from last year, (subtract it from your business income before entering it into the program), but it’s still annoying that it’s not covered in the TT software. As I recall, the packaged product doesn’t cover it either. 1. You don’t have to deal with installing software on your system. 2. 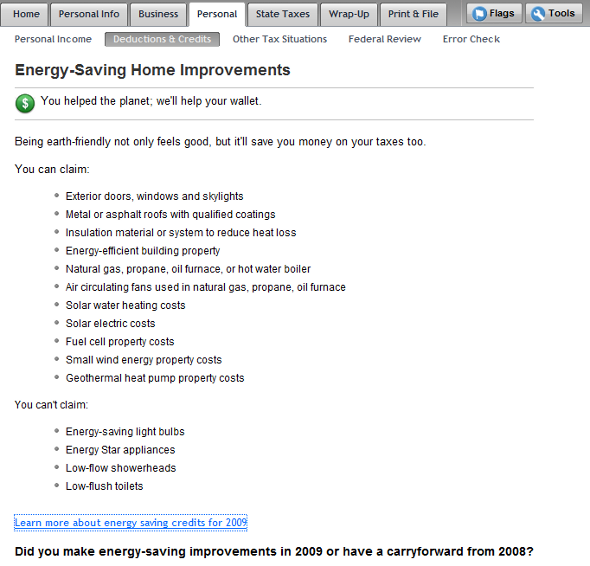 With the American Express discount, the price for the Home & Business Online was only $56.20 plus tax. 3. As I mentioned, eFile is included. Of course, if you owe money, it’s not as attractive since you have to send in a check, it might as well include a few sheets of paper. 4. They keep your data on file. Of course, you have to trust them that it is encrypted and secure. You can save all the forms and supporting tables as a large pdf file just like the packaged software. 5. You can always revisit the site and do what-if calcs without having to reinstall the software on your system and restoring the backup. Signing up and filling out a return is completely free, (you just need to pay to print out the claim or file it), so if you have time, you should run your return through it and compare it to the results you achieved from the packaged product. Great tips Robert, and I definitely can date these in the future, if you look at the URL of the post you can see when I posted it there but I can expose the date as well.